This Making Short Vowel Words activity is one that was set up for my preschooler, but could easily be modified for a toddler. Using new and different tools is one of my favorite ways to get my kids excited about learning. Anything can be made a little more interesting if it is presented in a unique way. 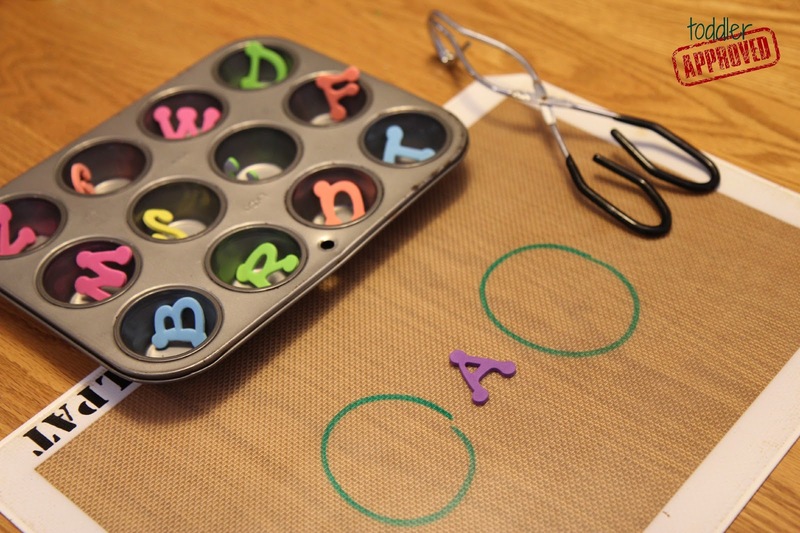 Last week I got out a few new(er) tools and set up a making words activity for my preschooler. I started off by putting a different consonant foam letter in each spot in the muffin tin. Then I drew two circles with the white board marker and put a foam vowel in the middle of them (see above)... stuck to the board. Next I handed my son the tongs and encouraged him to pick up one letter at a time and place one on each circle. I explained that it didn't matter which beginning or ending letter he picked. Once the letters were set up we practiced sounding out the word he created. We had a good laugh as we read the words and many were not real words... but were silly nonsense words. I didn't make him only create actual words... and I think that made the game the most fun. Picking up the letters using the tongs was a bit of a feat at the beginning and then he got better and better at it. Using tongs is always a great way to work on strengthening finger muscles and developing fine motor skills. Making and sounding our nonsense words is a great thing because it helps you really see whether your child is picking up on (and applying) the phonics skills that he is being taught. As you practice working to make and sound out nonsense words, you can help teach your child strategies for decoding unfamiliar words. Instead of making short vowel words you can use this activity to help your toddler explore alphabet letters! Draw 4-5 circles on a white board (or washable mat like I used). Then set up the foam stickers in a muffin tin. Hand your toddler the tongs and encourage her to pick up letters and put one on each circle on the mat. As she picks up each letter you can label the letter by telling her what sound it makes or what letter it is or a word that the letter starts with. You can also write the alphabet letters on the whiteboard (or mat) and have your child pick a letter from the muffin tin and drop it on the matching letter. You could do this with numbers too or with having your child make her own name using letters and tongs! Love this! What a great idea for incorporating fine motor, spelling, reading, and fun! Great idea! Thanks for the modification for toddlers. . .we're definitely going to try this out! I love the tongs ... fine motor AND fun! What a great game to learn short vowel sounds!! !